Most of the issues I write about on this blog are national issues, even when they depict a local situation. This one is no different. As the Tories prepare to allow housebuilders to avoid ‘affordable housing’ provisions built into planning permissions on the spurious grounds that it will kickstart the economy, property developers are sitting on hundreds of thousands of dormant planning permissions because of lack of commercial interest in proceeding. As a result of this, some semi-developed or undeveloped sites are sitting untouched for months and years – and in some cases this is having a heavy negative impact on the people who live near them. I have the privilege of being involved with the Whinney Banks estate in Middlesbrough. 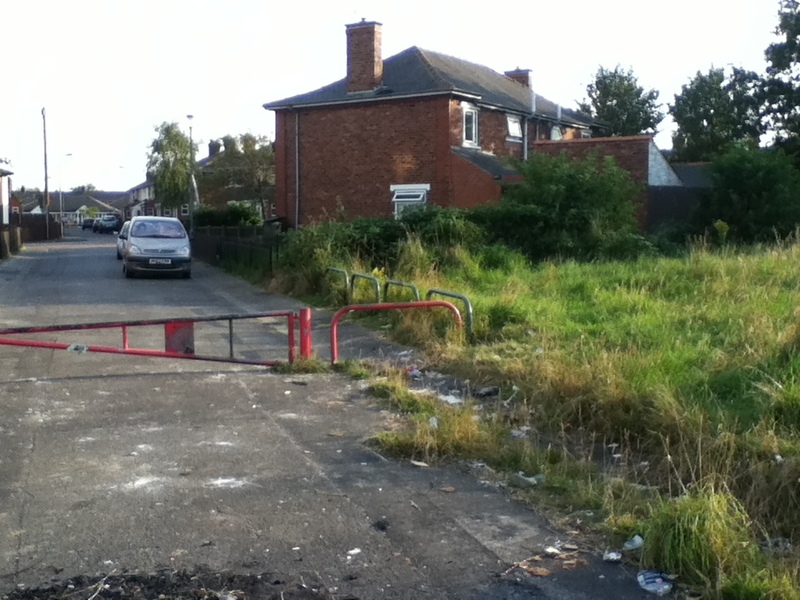 Middlesbrough is one of the nation’s poorest towns, and in some ways Whinney Banks is one of the most challenged areas of the town. But in terms of community spirit and human kindness in adversity, it’s not lacking. However, it is an area that doesn’t do well in terms of social provision and political attention. About 9 years ago, the local council knocked down a large area of social housing – no doubt with good intentions – and sold the land to a locally-based housebuilder, Bellway Homes. This is the road that used to lead up to houses. Now it leads from the old estate to nowhere. Grass is feet high. Inevitably, wasteland invites littering and dumping. Kids light fires, bottles get broken. This is looking west toward the A19 dual carriageway. Above the top edge of the long grass, you can just make out an area on the other side of the fenceposts that is still owned by the council. It’s not near any houses, but because it’s council-owned, that grass is mown and neat, and the area is uncluttered. This photo looks toward the new Bellway houses. More tall grass. The black band in the middle is an area that Bellway sprayed to kill the grass – and then left. The grass died and dried out, and eventually caught fire. Bellway has done nothing to the area and has given no indication of any intention of doing so, in spite of contacts from residents and the council. In this final picture, you see the older part of the estate – a place with nowhere for kids to play and hang out together except on busy roads – or on a single floodlit football pitch 15 minutes walk away and across one of the towns busiest arterial roads. If you’re willing, I’d like to ask you to help me move Bellway Homes into doing something about this area – specifically to create an adventure play area and to landscape the rest properly. 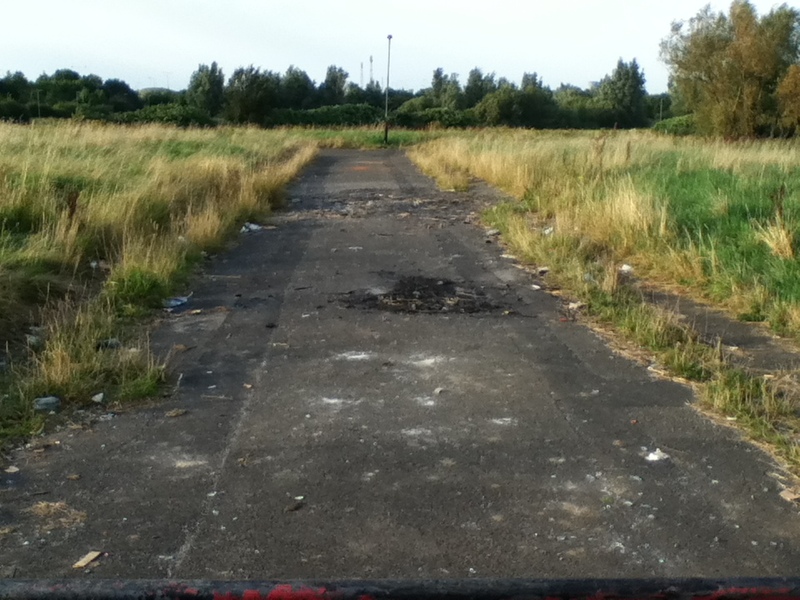 This area has already been left undeveloped for 9 years and Bellway show no sign of correcting their neglect. At the moment, they’re clearly not interested in making anything of it. But if enough people express an opinion and call on them to put it right, the fear of bad PR might just change their minds about the value of doing something about this neglected eyesore. Please use the contact form below to send an email to Bellway Homes’ office. I’ll receive a copy too, so I’ll know how much pressure we’re exerting. This is a chance to take a small, practical step to help people to change a situation they’ve suffered for years, and I hope you will join in – and if you know of similar situations in your area, where property developers are protecting their profits at the expense of quality of life for local people, take action, find ways to increase awareness and create pressure on them to do better. Please use your own wording, but be sure to include mention of the Whinney Banks estate in Middlesbrough, the fact that the land has been neglected for years – and especially that you expect Bellway to provide an adventure play area and to landscape the rest of the land properly, to improve the lives of local residents. I did notice, however, you failed to mention which party runs Middlesbrough Council, along with who the local councillor is, and who your local MP is. In the face of more houses due to be knocked down in the area, perhaps it would be more apt to encourage the council into doing something about this mess, and ensure any further housing contracts don’t allow a similar situation to come out of it. Nobody says Labour is perfect or always gets it right. In the end, though, the land doesn’t belong to the council any more, but to a private developer. The land on the other side of the fenceposts is council land – and is perfectly tended. Your party thinks private provision is always better and more efficient (somehow even after the G4S debacle) – this (as did G4S) just shows how foolish that is. Private money does what suits it, not what’s best for people – a change in public awareness might tip the balance of what Bellway considers is in its best interests, so that it does something about the eyesore. In the face of all of it, it would be better not to sell off more council land, not just to try to tailor the contracts better!